Arrian's "Campaigns of Alexander," widely considered the most authoritative history of the brilliant leader's great conquests, is the latest addition to the acclaimed Landmark series. After twelve years of hard-fought campaigns, Alexander the Great controlled a vast empire that was bordered by the Adriatic sea to the west and modern-day India to the east. Arrian, himself a military commander, combines his firsthand experience of battle with material from Ptolemy's memoirs and other ancient sources to compose a singular portrait of Alexander. This vivid and engaging new translation of Arrian will fascinate readers who are interested in classical studies, the history of warfare, and the origins of East--West tensions still swirling in Iran, Iraq and Afghanistan today. 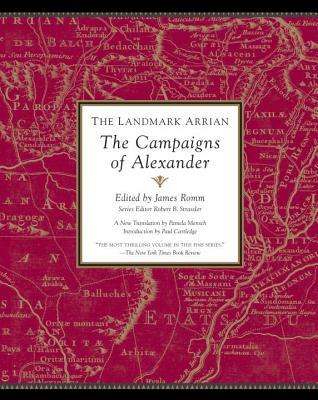 Enriched by the series' trademark comprehensive maps, illustrations, and annotations, and with contributions from the preeminent classical scholars of today, "The Landmark Arrian: The Campaigns of Alexander" is the definitive edition of this essential work of ancient history.